Artist Ed Jaffe found a unique way to “sculpt” paintings as a way to continue creating artwork that reflects his love of the three dimensional. Visit his website to see more of his work. 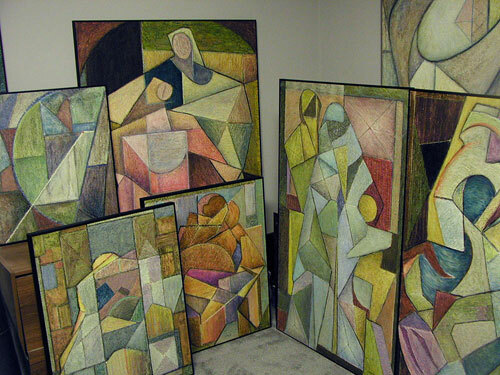 Some of artist Ed Jaffe’s paintings ready to hang for a show. I seem to live my life in twenty year segments. As I write this, I am beginning my fifth cycle. Twenty years to grow up. Twenty two years in Manhattan as an advertising photographer. Twenty years in Vermont learning to sculpt. Twenty years in Virginia as a sculptor and gallery owner; and now, beginning again in Connecticut. Three years ago I had to quit sculpting in marble. After many years of using power tools the process finally caught up with me and I reluctantly gave it up. I had been painting all along as a change of pace from the physical, lovable, enjoyable days of carving stone. The paintings filled a void in my life but the studio space no longer felt the same. It was time to start over again. I decided to come home to New England. My paintings are usually a reflection of my travels. Years in Central America and the Mediterranean have established my palette and the use of space. Other cultures have influenced different bodies of work. My question has always been, “How three-dimensional can I get on a two-dimensional plane?” I also try to keep every square inch as interesting as the whole canvas and I want to keep your eyes moving around after you have seen the painting as a whole. I try for volume, space and texture. After all, I am a sculptor who paints. I kept thinking of how I could make my paintings more like sculpture and eventually came up with the idea of creating a piece of wall sculpture first, then covering it with gesso and turning it into a painting. It’s amazing how light plays on these shapes as the day changes. How do they begin? A few broad marks with charcoal to create a problem and then I work on them until I solve the problem. Each piece takes about a month. While I’m working on one, I’m beginning another. It all starts with the drawing. Then I scale it up to the final size (usually 32” x 40” or larger). The basic construction is foam core. As the piece progresses, it becomes a matter of understanding geometry. Draw a rectangle on a flat surface and then tip it up 45 degrees. You now need a different size to fit the same space. It was a mental exercise at first but it’s getting easier. Each piece is like inventing a solution to the puzzle. As they connect to each other, the drawing becomes reality. It’s a new adventure for me and that puts me right where I want to be. Artist Ed Jaffe invites you to follow him on Facebook. Hi Linda, Radical moves like this are always evolutionary. When you and John were last here I was still getting everything unpacked. Today I have become a part of the community and would look forward to showing you around if you find another reason to visit CT . I have found some terrific places for lunch or dinner. #64 is still available if you ever carve out enough space for another Jaffe in your home :-). Stay well. Some great examples that only begin to cover your breadth. Partial to “Family” and Geisha. We will connect soon, my friend. Thanks Eric, I appreciate your interest in my work.. and more important , your friendship. Glad to hear the one-“e’d” side of the clan continues to do well. You may recall that Sharon and I visited you in Orange several years ago — I still have the photo taken in front of the gallery — and I bought a painting, basically a madonna-type work in deep blues, from your Latin America days. Hope all continues well for you in Connecticut. Ed Jaffee, now in Winchester, VA, to be nearer our three grandkids and their families. I remember your visit and the painting well. That was a fun series, Two of the Otovalo girls remain in my own collection.